This is a quick “frequently asked questions” post if you want to show off your beautiful load screen or view an update made from your Dashboard. The short answer: close your app then re-open it. I wasn’t quite sure what to make of it, but I responded. Victor called me the next day. He explained to me how his daughters “made him” get a smartphone. He figured out how to download apps and got excited when he found our “crib sheet” app from his alma mater. Victor hadn’t been in contact with his school since he graduated in 1970, but reconnected with his frat house earlier that morning via the app. I call this “discovery”. If you follow our blog, you’ve read my lovely wife’s series on best practices for promoting our app. When you promote, you get downloads from connections that already exist. But what about the “Victors” of the world? When your app is in app stores, alumni find you. That’s powerful stuff. Each type of phone has their own app store, but they work in much the same way. Search for a term and download an app. 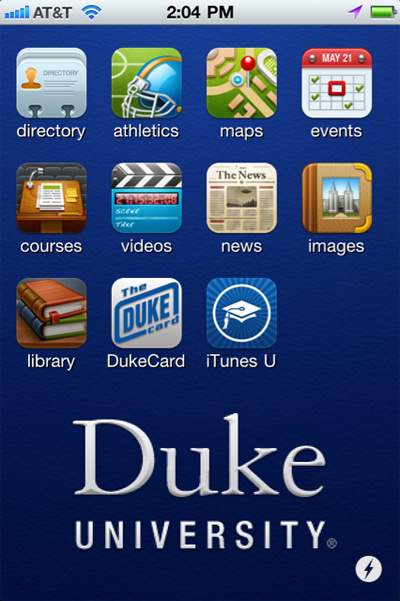 When I first got my iPhone, the first thing I did was go into the App Store and search for “Duke,” because I’m a Dukie. Based on feedback and statistics, “discovery” happens. Alumni are reconnecting by searching an app store for their alma mater. In short, your alumni are out there looking for you. And, as the case of “Victor” proves, they are not always the ones you’d expect. Once you “get religion” that mobile is the future, your next step is to decide on a mobile strategy. At this point, someone may ask you, “Do you want to go with a mobile website or a native app?” If your response is, “Um, wha?”, read on. In this post, we’ll define these terms and suggest a few things to consider. Sometimes referred to as “web apps,” these are simply websites made for the tiny screens of a mobile phone. 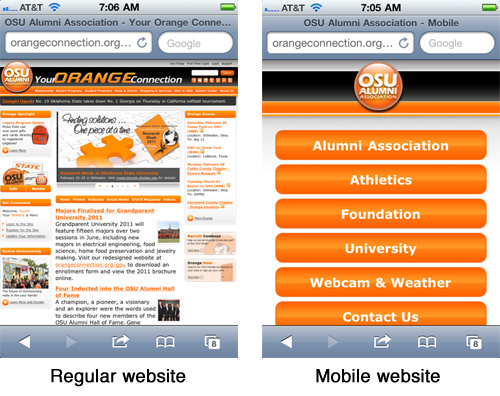 On the small screen of an iPhone, the mobile website (right) is easier to use than the regular version (left). Native apps are little bits of software that are built for and live on your phone. To read more, see our post called “What’s an App?”. These apps require unique sets of code for each type of mobile device (e.g., iPhone, BlackBerry, Android, etc.). Building a mobile website is a good alternative to asking your users to read your regular website on a mobile phone, especially if you are directing them to a feedback form. A mobile website is usually less expensive than building your own native apps across several platforms (e.g., iPhone, BlackBerry, Android, etc.). Shameless plug for our app: we’ve leveled mobile website vs. native app price benefits by selling an affordable, customizable native app. The code for a native app “lives” on your mobile device – as a result native apps work much faster than mobile websites (no “browser lags”). Don’t underestimate this benefit. Speed is key — everyone knows that figurative “speedbumps” slow down action, but few people appreciate that even the smallest speedbumps turn away users. This icon is always on your users’ screens and never out of sight. With a tap of the icon, your users are in your app. 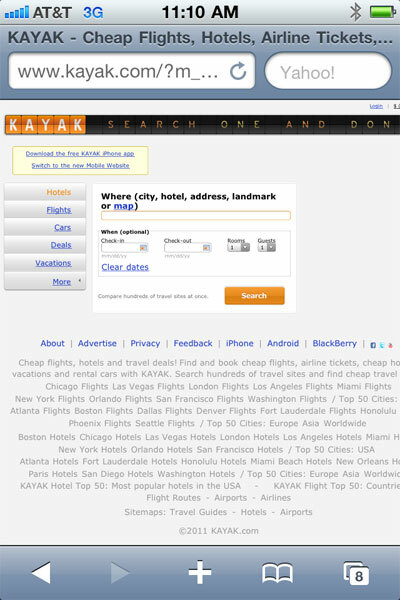 To access a mobile website, you generally need to type in a hard-to-remember URL address. Users can “bookmark” a mobile website and might jump through hoops to create a mobile app icon, but it’s clunky. Native apps, on the other hand, are easy. They keep your brand present and easily accessible. When people are looking for apps for their phone, they search an app store. Only native apps can be listed in an app store. 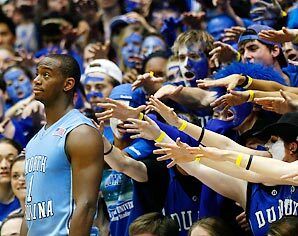 I wanted Duke on my phone. Your alumni or members will discover your app by searching for keywords, such as the name of their alma mater or your organization. A native app can include more bells and whistles because it can access other parts of your phone, like your camera, address book, an so on. Native apps are heavily marketed on tv. “There’s an app for that.” People have been taught to use native apps. A mobile website is a choice in the right direction; but a native app is going to be faster, more usable, more customized and more functional. If you’d like a native app for your organization, you may consider building one yourself or you might customize our app, Crib Sheet, for much less money. We’d love to have you as a customer. Do I create a general app for my institution or multiple niche apps (e.g. one just for alumni)? 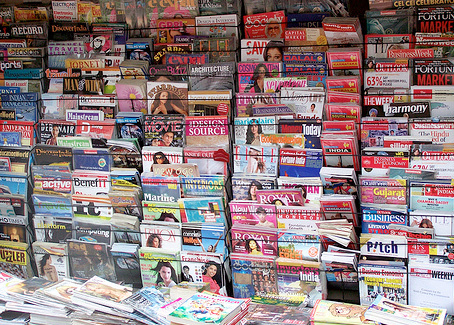 People generally prefer information that is catered to their specific interests. We think this preference holds true for mobile apps. Though admittedly a very small sample size, my own little family is a shining example of this. I read news, my wife loves celebrity gossip, my daughter could dress up dolls 24/7, and grandma can’t get enough of sudoku. Apps, by their very nature and design, are meant to cater to specific needs. Since mobile devices have smaller screens, they demand a more focused mission. The App Store has over 300,000 apps. They don’t all do the same thing. Some schools have started their mobile strategy with an app for their student body: campus maps, directories, bus routes and so on. 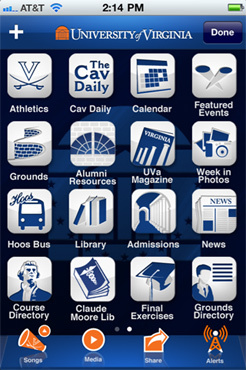 Duke (my alma mater) has a great student app, but it doesn’t “feel” like it’s for me, so I don’t personally use it. In addition, alumni offices have different needs (address updates) and messaging (benefits and events) than other departments on campus. 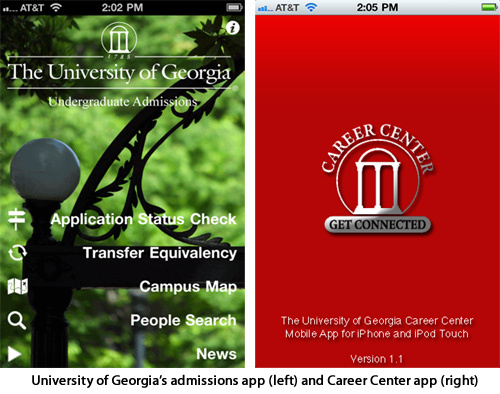 Some schools try the “everything” app approach by including an alumni module in their “student” app. It didn’t make her feel particularly special when “Alumni Resources” carried the same weight on the screen as “Grounds” and “Claude Moore Lab”. 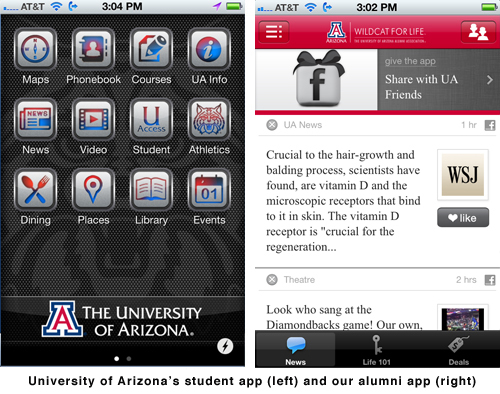 Personally, I think alumni want a focused app made just for them. Over time, I’d expect to see many schools with an admissions app, student app, sports app, and an alumni app. Think of an app as less of a product and more of a communications tool. Every school uses different web pages and different marketing materials to speak to different audiences. Niche apps play this same role. – promotion of alumni-specific benefits (e.g. affinity partners). As you develop your mobile strategy, if niche apps make sense to you, we encourage you to check out our “crib sheet” app for your alumni or members. In my experience, you’ll probably pay north of $100k for a polished iPhone app with good functionality, but you could pay $20k for something really simple. Multiply those figures if you also want your app on iPad, Blackberry, and/or Android devices. Read on for some of the criteria I’ve learned to consider. If we built an app with the very basics — just some text on the screen — users wouldn’t return. 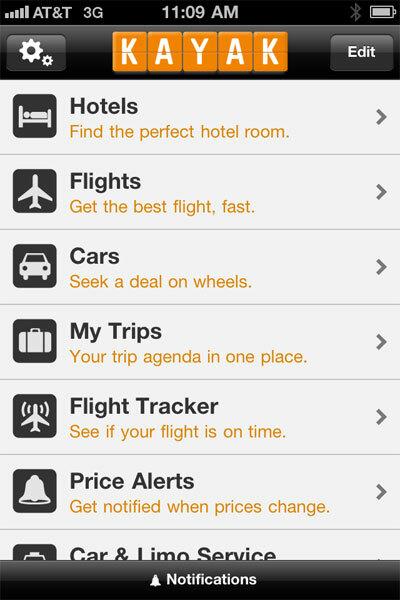 We needed more complex functionality (a news feed, feedback forms, polls, and the ability for our sponsors to update the app “on the fly”). What I learned: Functionality is expensive, especially in apps. Good graphic design is one of the first things a user notices when visiting an app. What I learned: You really need a good graphic designer to make your app look professional. I knew that graphic design was important, but it took me a while to appreciate “interaction design”. 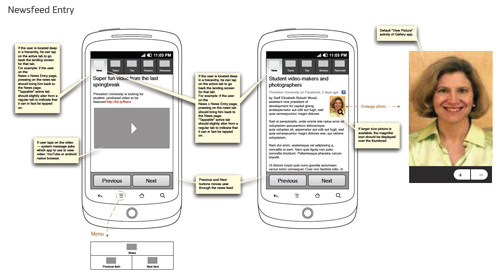 Think of interaction design as the “big picture” thinking of an app. It’s the blueprint (wireframes) for how everything works. What I learned: Design is essential at the beginning of the process. You may spend a lot of time up front, but this forethought will save you a lot of money in the long run. I dove into our app development underestimating the difference between designers and coders. In short, coders don’t design apps. They build apps. You wouldn’t tell a carpenter to build a house without blueprints from an architect. What I learned: You can’t give a coder a general idea for what you want and expect that he or she can read your mind. Spend the money to draw up good plans first. I knew that I wanted our app on more than just the iPhone. If we had developed for only one platform, we’d exclude a whole bunch of users who don’t have that phone. What I learned: The coding for one platform is not easily transferable to another platform, so you need a different coder and designer for each platform. Unlike building a house, when you build an app, your foundation is constantly changing (maybe it’s like building a house in California?). At least once a year, the “OS” (operating system) is updated. The OS is like the foundation that all of your code runs on. Your code needs to be updated every time the OS is updated. Also, when new phones are released, your code may need to be updated. For example, when the “retina display” was created for the iPhone 4, it was great for users, but a pain in the rear for us. We spent days updating our photos and images. What I learned: You’ll need to pay for code updates when the OS changes and new devices are released. “Experienced” programmers have three years experience, so determining a competent programmer vs. a “big talker” is difficult. What I learned: Going abroad is almost always cheaper, but you often get what you pay for in terms of quality, design, and communication. Building a professional, functional app on your own is expensive. The costs range wildly (anywhere from $50k to $100k+) for just one platform, such as the iPhone. I encourage you to read more articles and posts from people who aren’t trying to sell you an app. In addition to costs, building a good app takes time and focus. If you’re an organization in the business of X, your focus should be on X.
We’re in the business of apps. We’ve spent the last two years learning what’s important, making revisions and building a great, customizable app called “crib sheet”. 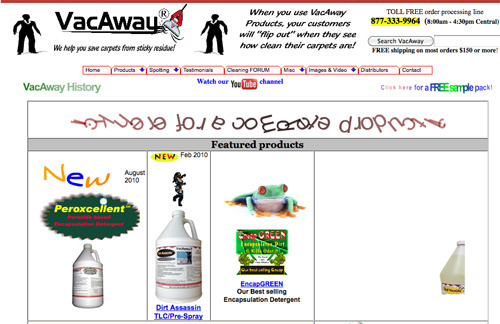 Our prices are reasonable. Our annual subscription will cost you less than the annual maintenance costs if you built your own app. With the huge growth in mobile, now is the perfect time to get a mobile app for your organization. We encourage you to check us out. The term “App” is short for application. Apps are little bits of software that live on your phone – designed to enable you to easily do an endless number of things from your phone like checking the weather, finding movie times, taking photos, or reading the news. 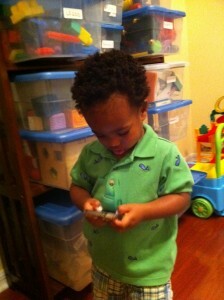 My 1 year old son is obsessed with the apps on my phone. He knows that if he gets antsy enough in a restaurant, my phone will show him Sesame Street. He drags his sticky fingers across my screen as he video chats with his Aunt Anne. The other day, my wife found him holding her phone and softly whispering “Anne?, Anne?”. Where Can You Get an App? You typically get an app through an app store. 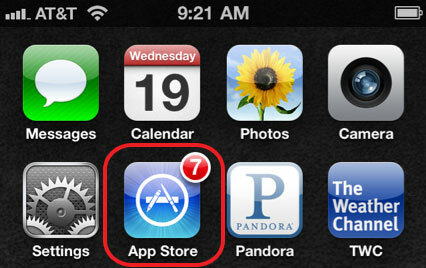 There will be an app store icon installed on your smartphone. Tap on the app store icon. 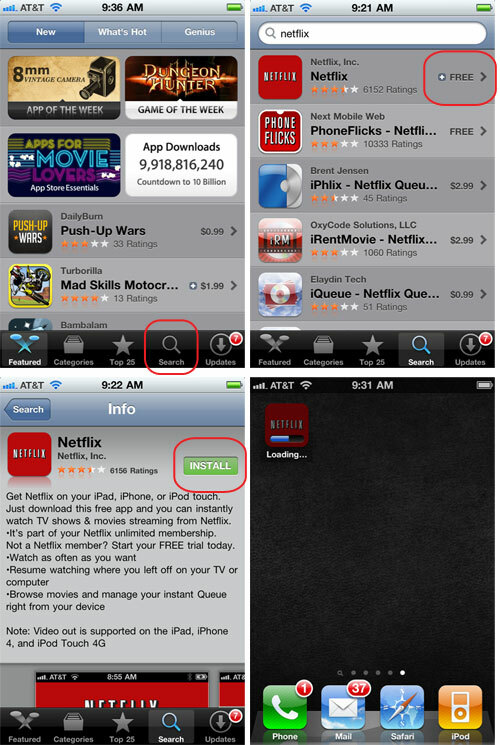 Do a search for whatever kind of app you are looking for, tap install, and it downloads within seconds. Many apps are free to $.99 while some can cost north of $10. Can’t I Just Use the Web? Apps work better than the web on phones because, well, apps were designed for phones. They’re faster and more functional way to complete a task. Apps are growing even faster than the ridiculous growth of smartphones. Mobile app downloads are expected to grow from 11 billion downloads this year to 77 billion in 2014 (a SEVEN-FOLD increase). The marketing machine for apps is starting young, and ain’t stopping. Just ask my son. 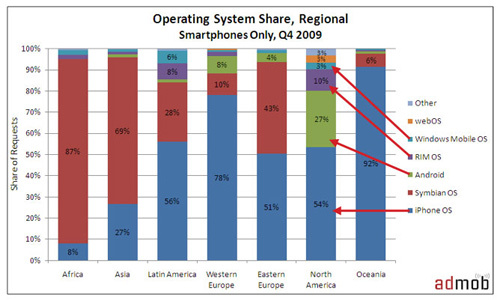 Smartphones and other “smart” mobile devices aren’t just growing, they’re growing at a ridiculous rate. I’ll spend the second half of this blog post sharing some statistics and links, but before I do, let’s talk context. 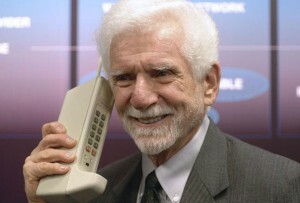 Mobile phones were first seen in the 70s. Over time, the phones got smaller (thankfully), cheaper, and more powerful. 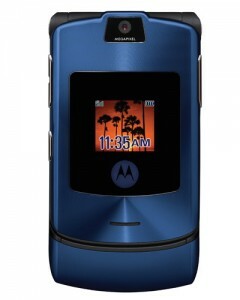 Besides calls, these “feature phones” allowed people to “text” and take basic photos. Today, the U.S. cell phone market is considered “saturated” – it’s hard to find someone who doesn’t have one. Now we have a new wave of technology. Smartphones, which I’ll define as a phone which uses “apps”, are exploding in growth. I’ll give two reasons for this (there are many). With maybe the exception of a wedding ring, not much else travels with you every day, everywhere you go. 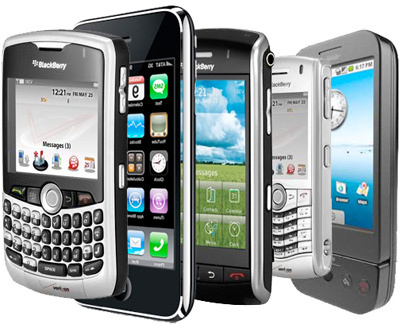 Calls, texts, e-mails, photos, appointments…my cell phone is a clearinghouse for a lot of my daily contact with the world. When a new cellphone comes out with a new bell and whistle, it means that I can do more in my life. Given the option to get a phone which can use apps (i.e. do anything), people jump at the opportunity to add another finger to their third arm…or something. When you pay $199 for an iPhone, you’re actually paying over $500 for that phone over time. A portion of your monthly cell phone bill pays for your phone. But, once your two year contract is finished and your phone is paid off, your monthly rate doesn’t drop. 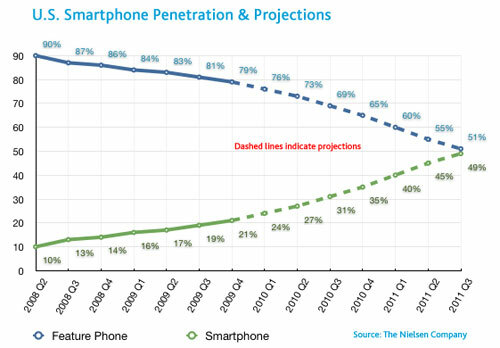 If it did drop, people might keep using their old phones for years (gasp). Instead, you’re encouraged to buy a new phone at a low upfront cost and a new two year contract. It’s an efficient mechanism that quickly cycles people towards newer technology. 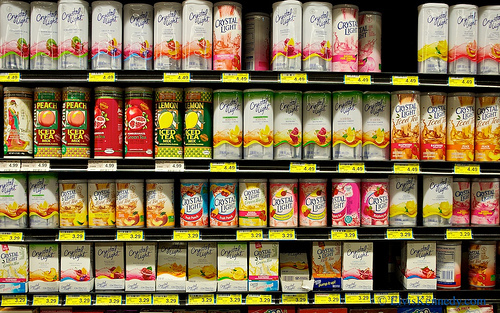 Do you buy a refrigerator every two years? Toaster? Car? The adoption rate for smartphones is growing at a ridiculous pace due in part to these atypical phone economics. We think smartphone usage for our user demographic is even higher because most of our users are college graduates (more affluent and technology savvy). AdMob, the biggest supplier of ads on mobile devices, has seen a DOUBLING of ad impressions on popular smartphones (Android and Apple/iOS) in the last SIX MONTHS. 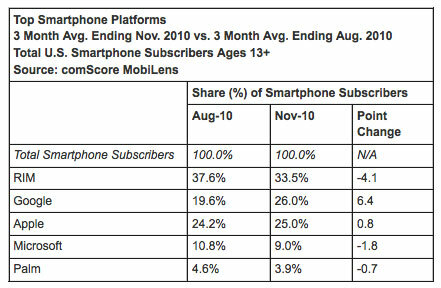 Nielsen is predicting 80 MILLION new US smartphone users in just 2011. To put this in perspective, we have roughly 300 million people in this country. Google reports that there are over 300,000 Android phones activated PER DAY. Fortune predicts that smartphones will soon outsell COMPUTERS due to “insane” growth. Apple has partnered with Verizon to sell the iPhone open up their market to 90 million new subscribers. Microsoft has launched their new mobile software and are devoting over $500 million to promote it. The marketing budget for our mobile app is a little smaller. The VC (venture capital) community is focusing on and aggressively funding mobile companies. And all of the above statistics don’t account for the rise of tablet devices, like the iPad, which I’ll cover in a future post. The future is mobile devices. Go “mobile” and you’ll be able to sustain the kind of smart communication that builds long-term loyalty to your institution.